The Friday photo this week provides a tiny glimpse of the past through this old hand painted sign which has been revealed as part of the Midland Metro Extension on Stephenson Street in Birmingham City Centre. The sign is a great example of a hand painted sign on wood. This would have been typical of those found on buildings during Victorian times in Birmingham. The sign is at the rear of the Waterstones (New Street) store in the grade II listed former Midland Bank Building, built in 1867. The rear extension was part of a later extension added in 1875. The building is included as part of the Colmore Row Conservation area. Some of the first part of the sign is still missing so it is hard to make out. The lettering that is visible is ” & Son Railway & Steamship Passenger Agents”. It has been suggested that this maybe Henry Gaze & Son who were a popular Victorian travel agents. The new work to make way for the tram includes taking back Waterstones rear shop facade which will provide pedestrian access around the corner. A Waterstones sign will then once again hide this lovely old sign until it emerges again sometime in the future. Pity that as part of the current redevelopment they’ve removed and destroyed those wonderful stairs that used to flow up to the first floor. Surprised this was permitted. Those stairs weren’t original. They were only put there in the 1990s when Waterstones opened. As the Engineer working on Waterstones as part of the Midland Metro Extension, I can confirm that the signage read Thomas Cook & Son Railway & Steamship Passenger Agents. Around the corner on Stephenson Place was a sign that said Bureau De Change in the same style of writing and paint. Also visible is enough of the last letter of the family name showing an R or K. The penultimate letter looks like a round letter, C or O presumably. Pretty sure the name that’s hard to decipher is Thomas Cook and Son. Midland Bank and Tommy Cook’s had a close working relationship, even up to the 1980s-1990s. Opened the BCT e-mail at 11:00, rushed for the next train to Birmingham, and was photographing it myself by Noon. I’m a big fan of the Friday photos, and Tracey Thorne’s work, this has to be one of my favourites. Took a group of Dutch Solicitors on a walking tour of the city later in the day, and took them on a detour so they could see it. I emailed you about this sign on Wednesday and am glad to see you took my suggestion on board to go and visit site. I LOVE that my branch of Waterstones has made it onto the friday photo! Two other signs have been removed: This Cook & Son and Beaureu De Change. Both photos are posted on the New St Waterstones twitter account. It would be great if this is not covered up in any future works. I’m still shocked that the wonderful Anatomical Boot Company sign on Colmore Row disappeared. 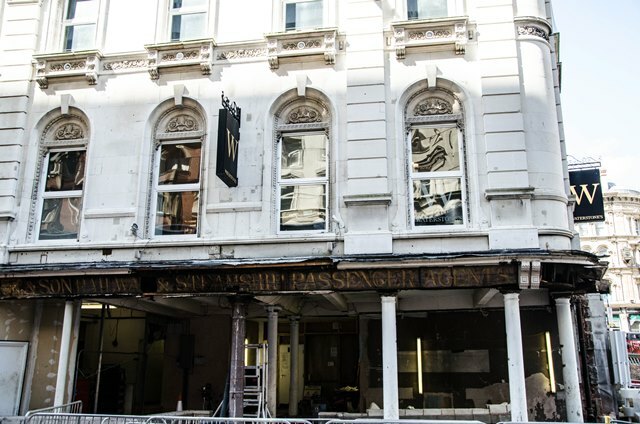 The owner of The Anatomical Boot Company in Colmore Row told me, shortly before the shop’s closure, that the sign had been carefully removed and was stored in the basement. The new owners, Crockett and Jones, wanted to remove the ornate ironwork at the rear of the shop, and were annoyed to discover it was listed and could not be touched!